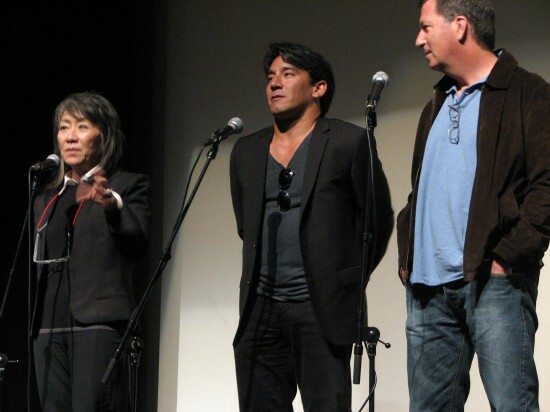 The producers of “Emperor,” a historical drama now playing in theaters nationwide, attended a recent screening in Little Tokyo to talk about why they made the film. Set during the U.S. occupation of Japan, the story begins with Gen. Douglas MacArthur (Tommy Lee Jones) ordering Gen. Bonner Fellers (Matthew Fox) to launch an investigation to determine whether Emperor Hirohito (Takataro Kataoka) should be tried as a war criminal or allowed to remain as the country’s symbolic leader. Sparing the emperor would go against American public opinion, but executing him would cause open revolt and make Japan impossible to govern. A free screening at the Aratani Theatre on March 3 was preceded by a statement from Deputy Consul General Masahiro Suga, who said that the movie “doesn’t describe … war heroes. It describes, based upon historical facts, the process and especially the first step of rebuilding friendship again by former enemies. Producers Yoko Narahashi, Eugene Nomura and Gary Foster took part in a Q&A session with Dr. Pedro Loureiro, one of the film’s historical advisors, serving as moderator. For Narahashi, whose credits include “The Last Samurai,” “Emperor” is a personal story because her grandfather, Teizaburo Sekiya (played by Isao Natsuyagi), helped arrange the historic meeting between MacArthur and Hirohito as a member of the emperor’s Ministry of the Interior. 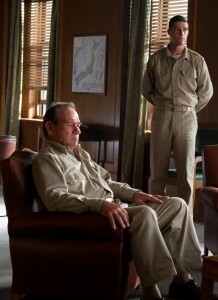 Tommy Lee Jones and Matthew Fox star as, respectively, Gen. Douglas MacArthur and Gen. Bonner Fellers. Foster recalled that his research for the film revealed “all the work that was done to make the peace. There’s so many movies that are made about the prosecution of the war … and very few have been made about how the peace was won. I was very intrigued because not only was the peace won, but it was sustained to this day, and it’s a very rare occurrence in the history of the world. The movie includes a fictional romance between Gen. Fellers (Matthew Fox) and Aya (Eriko Hatsune), a Japanese student he meets at an American college. Narahashi said the emperor’s people also provided “this really thick, old book of pictures of inside the palace,” allowing production designer Grant Major, who worked on the “Lord of the Rings” trilogy, to duplicate the rooms as they looked in 1945. Nomura said the visual effects team studied the devastation in tsunami-ravaged Ishinomaki, which was “very similar” to the aftermath of U.S. bombings of Japanese cities. The opposite strategy was used in casting Fox, best known for ABC’s “Lost.” “This is his first leading role in a major film … We wanted Fellers to be Fellers. We didn’t want people to look at the actor … We found a fine actor who also could just be the role and not bring distractions to it,” Foster said. One issue of contention during the Q&A was the absence of any Nisei who served as translators and interpreters with the Military Intelligence Service in occupied Japan. This was pointed out by Darrell Kunitomi, whose father, Jack, is an MIS veteran who was recognized at Congressional Gold Medal celebrations in Washington, D.C. and Los Angeles. 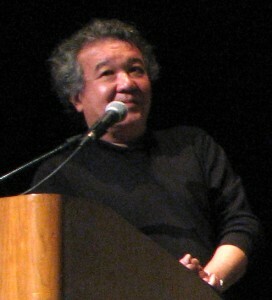 Masayoshi Haneda plays Takahashi, Gen. Fellers’ interpreter. 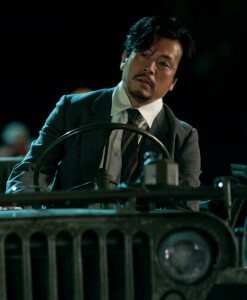 In the movie, Fellers’ interpreter is a Japanese national, Takahashi (Masayoshi Haneda). Another audience member predicted “blowback” from Chinese and Korean audiences angry that the emperor escaped punishment for Japanese atrocities in Asia. Closing remarks were made by Loureiro, who has served as curator of Pomona College’s Pacific Basin Institute. “It pleases me to see these kind of movies come out … At least it gets the general audience … to watch and understand. They’re not about to sit down and read the books, but a movie like this does the job. “As a historian, as a consultant … I want the stuff even more accurate … but I realize this is a commercial production. They will do what they have to do, but as long as they get this out, people start watching it, maybe my daughter will grow up and do a sequel to this. Maybe somebody out there will do the MIS … I think every little bit helps. “We apologize for the omission … For my dissertation, my work was on the Navy’s equivalent of the MIS. I interviewed all 24 senseis … I have a very close relationship with the MIS … (but) I couldn’t include everything. Some of my teachers who were involved in the International Military Tribunal, they weren’t shown, but I knew you can only do so much. Foster suggested that the DVD of “Emperor” could include a piece about the MIS. Accurate by JK, tho would add tension rose during Q&A, and producers rambled answers, were at times totallyinaudible and claimed “it’s a movie, not a documentary” as escape clause — I never buy that line of defense from filmmakers. IMHO and in my experience documentaries are slanted, info is chosen, footage is edited; the documentary filmmakers I know are all lefties. I have not personally heard of a single conservative documentarian tho am sure some must exist. Documentaries seem to me purport to be true-to-life, but in reality show selected info to make points. Commercial movies are intended to 1/make a profit, 2/show some history while making a buck. But apart from completely disrespecting the JA community — producers select the JAT in middle of LT, show your movie then expect a happy response when you exclude and ignore our Nisei veterans? You’re out of your righteous mind or in massive Hollywood denial. You ignored my dad, sitting next to me at JAT, filmmakers. He was there, along with hundreds of other Nisei MIS’ers, including those who worked directly with MacArthur right in his HQ. They were invisible to you. Must have been the falling dollars in front of your eyes. Sorry the movie came out the way it did, heard it isn’t doing well. Could have been better.